Prior to the Legacy Machine 1 which is a 21st Century tribute to the horological masters of the past, the Horological Machine 6 which is an incredible space machine for the wrist, we are proud to offer a third piece from the incredible creative lab of MB&F. The Music Machine 1 is a music box that forges a new vision both in terms of design and function. A true "toy for boys" this is an object that delights our inner child. 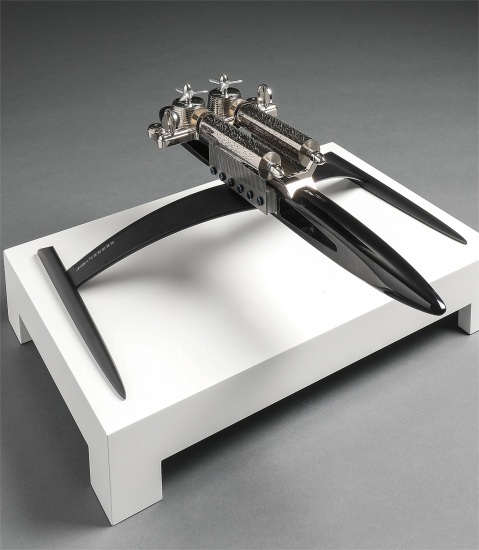 Made by famed Swiss music box maker Reuge, the Music Machine 1 is shaped like a spaceship and contrary to the habitual classical music tunes found in music boxes, it plays a total of 6 different tunes via two cylinders. The cylinders contain ‘the scores’ of the melodies, with as many as 1,400 precision-placed pins that pluck the teeth of the comb as the cylinder revolves. The left cylinder takes us to a galaxy far away and plays the Star Wars theme, the Imperial March (also from Star Wars) and the theme from Star Trek. The right cylinder is dedicated to rock’n’roll with Pink Floyd’s Another Brick in the Wall, Deep Purple’s Smoke on the Water and John Lennon’s Imagine. The Music Machine 1 was made in two versions each limited to 33 pieces: white lacquered walnut with bead-blasted and anodized aluminum and black lacquered walnut with black matte-anodized aluminum like the present version. An object like no other, the present Music Machine is playful, imaginative, decadent and a hand stretched out to our inner child.